The Rose Electronics UCR-1R1X04U/2 is a single pathway, 4 port KVM over IP switch allowing for 1 remote and 1 local user. This IP Console Switch features multi-platform capability, which allows you to control PCs, SUN, UNIX, Linux, USB, and serial devices from a single console station locally, or over the network. The UCR-1R1X04U/2 allows for a central user station to connect to four computers or serial devices per chassis, expandable to as many as 1,000. 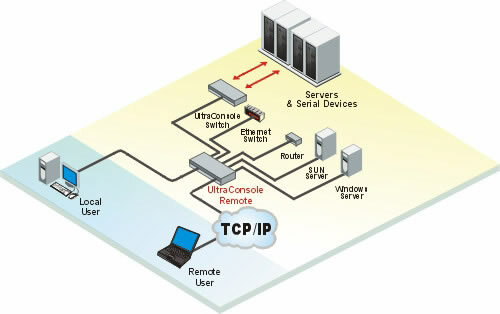 The user station can be accessed locally, over the network, or from anywhere in the world. The on-screen menus make configuring, monitoring, and installation easy with on-screen instructions and help. Use the on-screen menus to name computers, select computers, view connections, assign users, configure system security, and other features. The UCR-1R1X04U/2 provides serial support to access computers, routers, Ethernet hubs, UNIX devices and more. It can perform as a 'VT100/VT220' terminal emulator with an eight-page scroll buffer. The UltraConsole Remote 2 series is also available in 1 x 8, and 1 x 16 models. Units easily connect together to make a seamless and truly scalable Remote KVM solution.